Card of the Day ~Trust~ This is a time for trust. Sometimes there is no yes or no to a question. There are situations where we are better served by not knowing what is to come so that the miracle can unfold before our very eyes. Like children opening a gift, part of the magic of our lives is found in the joy of surprise! Trust that your angels have something amazing in store for you even if they can’t quite tell you yet what it is. 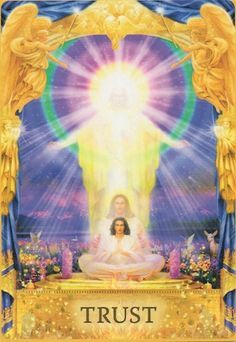 We all have been in situations where we wish we knew the answer to our question however; the Angels always have divine perfect timing for everything even if we feel it’s not fast enough. Trust and Believe in God and the Angels because they can always see everything before it happens. With peace and love in your heart I pray you have a fantastic day. I love you all!